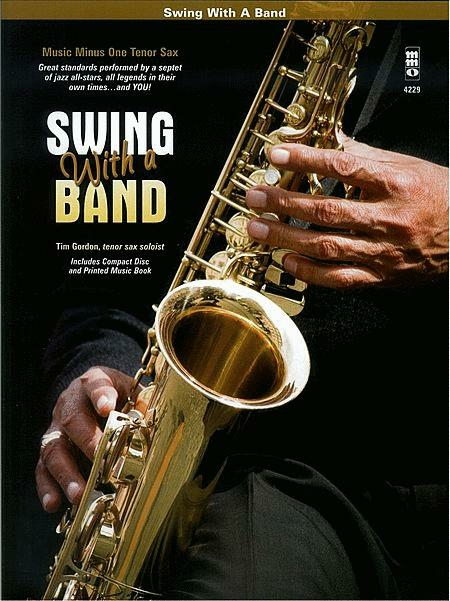 "This brand new edition from Music Minus One features eleven swinging standards performed by a septet of jazz legends and you. Listen to Grammy-nominated artist Tim Gordon on tenor sax, then step into the spotlight to put your own spin on these great tunes. From the high-quality sheet music to the world-class background tracks, this is an edition that will not disappoint! Milton Delugg - accordion; Bill Butterfield - trumpet; Phil Bodner - clarinet; Hank Jones - piano; Tony Mottala - guitar; Milt Hinton - bass; Don Lamond - drums". Don't Be That Way Composed by "Goodman, Parish, Sampson"
I'm Through With Love Composed by "Kahn, Malneck, Livingston"
Rose Room Composed by "Williams, Hickman"
I'll Never Be The Same Composed by "Kahn, Malneck, Signorelli"
How Am I To Know Composed by "Parker, King"
STOMPIN' AT THE SAVOY Composed by "Goodman, Webb, Sampson"
I Understand Composed by "Gannon, Wayne"
What Can I Say After I Say I'm Sorry Composed by "Donaldson, Lyman"
I'm In The Mood For Love Composed by "McHugh, Fields"
I Got It Bad (And That Ain't Good) Composed by "Webster, Ellington"